2 serrano peppers, Finely chopped. Saute onions and garlic till soft. Add curry powder and cook some more. Add everything else except lime and cilantro, cook till soft. Finally, add lime juice and cilantro and mix in. Serve with rice. 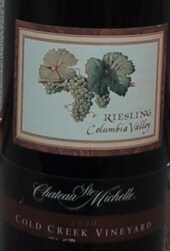 It’s excellent with a good riesling such as the nice Cold Creek Vineyard Riesling from Chateau Ste. Michelle. This dish can be pretty spicy. For those sensitive to heat, leave out one of the serrano peppers. This recipe was created by Rose and inspired by the Sweetwater’s Jamhouse in Portland OR. But I matched it to the wine.